Literary Hoots: My New Friend is So Fun! Of course Gerald and Piggie are the best of friends. And Snake and Bat are, too. But what does it mean when Piggie and Bat are playing together? Gerald and Snake fear they just might be having too much fun without them! Let's face it: I LOVE Elephant & Piggie books. I have a huge collection of them at home. But this one...not so much. Maybe I'm too much like Gerald and can't imagine Piggie with anyone else. 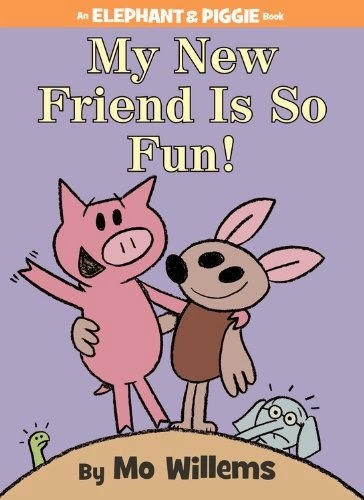 So here it is from an unbiased perspective: This book is a good example for kids on how to deal with best friends and the jealousy they might feel when their friend is spending time with someone else. Mo Willems is quite the expert in dealing with different emotions (oops, I got biased again). Anyway, you should read it and see what you think.